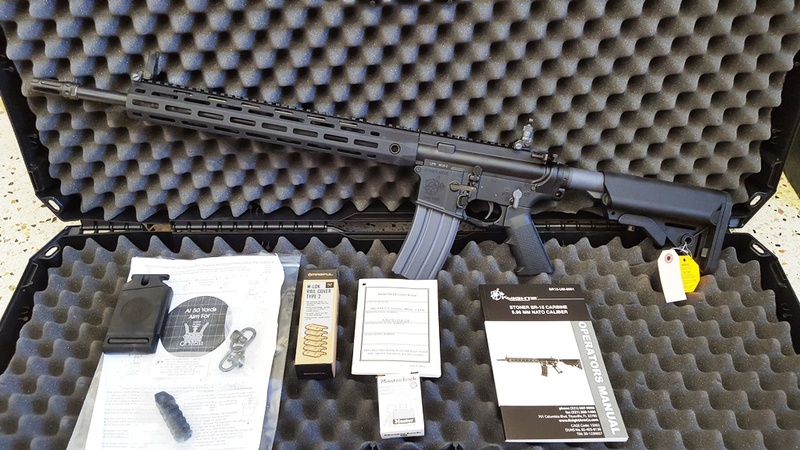 SR-15 LPR M-LOK 5.56MM 18" Match Rifle #31973. These LPR MLOK guns come with the LMT SOPMOD STOCK from the factory now. The SR-15 E3 Mod 2 series’ 5.56 mm NATO barrel is made for military grade durability, and is free-floated inside a URX4 M-LOK handguard. An improved E3 round-lug bolt design both enhances function and increases bolt life far beyond the industry standard. The ambidextrous bolt release, selector lever, and magazine release offers left-handed users the ergonomic advantages inherent to AR15-based controls. The drop-in two-stage trigger serves double duty as an aid to precision marksmanship while enabling surgical speed shooting at close range. The 5.56 mm 3-Prong Flash Eliminator interferes with propellant gas combustion forward of the muzzle to significantly reduce flash signature, will not ring upon firing or when struck, and is compatible with the Knight’s line of 5.56 mm QDC Signature Reduction Devices. M-LOK is a modular locking accessory mounting system that is a direct attachment method for hard mounting accessories to a negative space mounting point. The M-LOK attachment system allows the user to put mounting rails only where they were needed, as opposed to covering the entire surface with mounting rails, which are then covered with panels. The system also allows direct mounting of accessories, such as fore-grips and flashlights, with no rail interface needed.